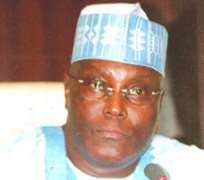 The activities of a former Vice-President Atiku Abubakar, the Abubakar Baraje-led New Peoples Democratic Party (New PDP) and the seven governors under its wing, have been accused of fanning regional and religious sentiments capable of pushing Nigeria to the brink of disaster as it approaches the 2015 elections. The Southern Kaduna PDP Unity Forum, under Senator Haruna Zego, which declared this yesterday, in the light of the developments in the PDP since the end of the National Special Convention in Abuja, said the polity was unnecessarily being overheated by the G-7 governors and their supporters. The group added that the post-presidential election crises of 2011 could be a child's play compared to what could happen in 2015 if the current actions of some politicians continue, urging politicians to put national interest above regional or ethnic considerations. As a panacea to averting trouble in the land in the 2015 election year, the Southern Kaduna PDP Unity Forum, which is made up of 24 leaders of the 12 local government areas in the southern parts of Kaduna State, strongly advice all political parties to pick their candidates from the South-south of Nigeria. 'We recall that when this happened in 1999 and major parties picked their presidential candidates from the South-west (Olusegun Obansanjo and Olu Falae), the elections were tension-free and there was no threat to lives and property. 'Again in 2007, the two major parties picked their candidates from the North (Gen. Muhammadu Buhari and Umuru Ya'adua) there were violence-free elections. However, in 2011, we barely escaped war when we had a Northern and Southern candidate in the major parties (Gen. Muhammadu Buhari and President Goodluck Jonathan),' they said. The group further said the gradual progress noticed in the banking, agricultural, Judiciary, transport and the recent privatisation in the power sector, amongst others has made them to declare their support for President, Goodluck Jonathan, leader of the party and the PDP under the chairmanship of Alhaji Bamanga Tukur.